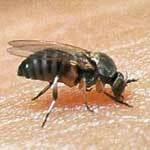 Gnat Bites - How to Identify and Treat Them? Gnat bites may not be noticed immediately, but when you realize that you have been bitten you may be surprised to find that this exact can have a powerful bite. You may notice a small drop of blood, along with itching, swelling, burning, and welting on the skin. Identifying insect bites is not always easy, and it may not be possible to tell whether the insect was a gnat or mosquito. Both mosquito and gnat bites can be treated effectively with ice to keep the swelling down and help minimize the pain and burning in the area. In rare cases gnat bites can cause serious allergic reactions, just like any other type of insect bite. If you notice severe swelling, difficulty breathing, hives, or other extreme symptoms then you may need to seek emergency medical. Although this is not a common reaction to gnat bites, in a few rare cases death can occur if medical treatment is not given. An important part of gnat bites treatment is to clean the area where the bite is located with an antiseptic to prevent any secondary infections, and you should also take an antihistamine to help prevent any swelling or other allergic symptoms. Ibuprofen can help with any discomfort, and it is important not to scratch the bite and break the skin even more.